The thing that stands out, amid all the craziness in Green Bay’s miracle 27-23 win, is just how damn high that pass went. It flew about 70 yards in the air, from Aaron Rodgers to Richard Rodgers, a heave that not many quarterbacks are capable of, but it’s the height of the thing, more mortar than missile. You won’t get a better angle than this fan-shot video from a few rows off the floor. The Packers practice the occasional hail mary, usually once in practice the day before a game. But it was only during warm-ups yesterday that Aaron Rodgers experimented with the ridiculous amount of loft he would eventually put on the winner. The QB was experimenting, seeing how high he could drop the ball in from. Because that’s how the play is designed: not only does a high-angle pass give receivers more time to make it down the field, but ideally, it gives them time to get in position to bring it down. “When you throw it with that arch you have a chance, because it gives guys a chance to fight for position,” McCarthy said. “That’s the whole design of it, and there’s a design to where you try to get to and the triangle that you’re trying to form (with teammates) down there. Richard is the perfect guy for that type of situation, big body and his ability to go up – you see his old basketball skills – and high-point the football. Interestingly, while the 6-foot-4 tight end has the body and the skills to go up and get the ball, that wasn’t his first assignment. As drawn up, the the ball was supposed to go to Davante Adams, who revealed after the game that Rodgers was placed out in front to clear out any defensive backs. But there were none. Look at the screengrab above: the Lions defenders have numbers, but their placement was terrible. Three of them are out of the play altogether, and when the ball did come down, there were three Packers who could have made a play on it, and just one Lion. The Lions D was inappropriate elsewhere—notice the two defenders hovering around their own 45-yard-line, ultimately useless on the play. Another anomaly: Lions WR Calvin Johnson, as tall and as good a leaper as anyone in the stadium, was on the sideline. 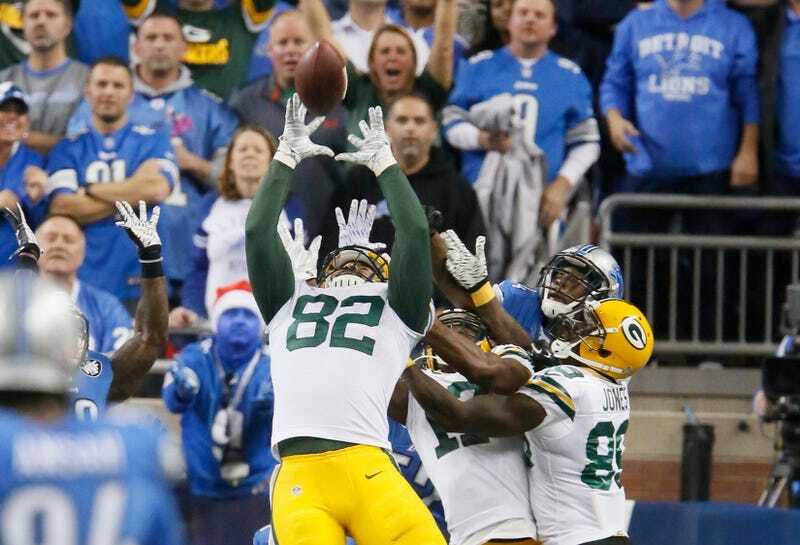 Johnson is part of the Lions’ typical hail mary defense, but on this one he was merely an observer. Lions coach Jim Caldwell didn’t specifically address the package, but from his comments it’s clear that Detroit wasn’t running a strict hail mary defense. With Johnson on the bench and two defenders milling about in the open field, this was a hybrid to defend against both a long bomb and a potential lateral play like the one that came before it. The range was extreme—NFL record-keeping on this is spotty, but it’s the longest game-winning pass on record—but Aaron Rodgers’s arm was capable, Richard Rodgers’s hands were sure, and the Lions contributed their bad luck and bad coverage to create one of the most unbelievable endings you’ll ever see.